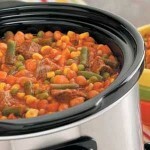 Zesty Beef and Vegetable Soup is a slow cooker recipe in a tomato base. In a large skillet cook ground beef, onion, and garlic till meat is brown and onion is tender. Drain off fat. 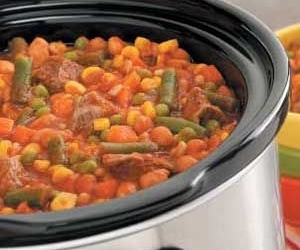 In slow cooker combine meat mixture, coleslaw mix, frozen corn, frozen beans, vegetable juice, undrained tomatoes, Worcestershire sauce, basil, and pepper.